There are seven speakers, songs, and prayers, another song, and then more prayers. Roxanne Ryan of the nearby town of Plains, Montana, a tall and unadorned woman, long gray hair framing a face of quiet stoicism, introduces each speaker. The sadness in her voice, her heavy air of tribulation, is real. 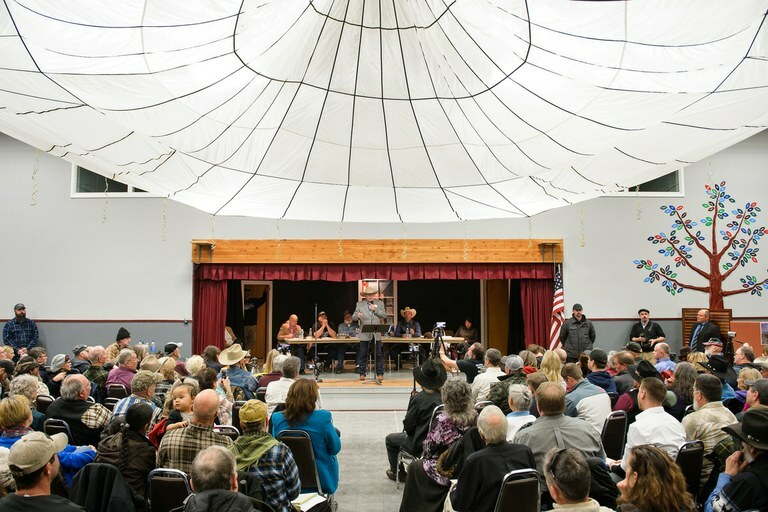 Roxanne’s son, Jake, one of the occupiers of the Malheur National Wildlife Refuge in 2016, is in Oregon, facing sentencing for his role in the refuge takeover. Her younger son, Jubal, is a featured singer tonight, belting out a rousing rendition of the seldom-heard third verse of The Star-Spangled Banner (“No refuge could save the hireling and slave / From the terror of flight or the gloom of the grave”), and the Ryan family will, as the hours wear on and energy in the big room begins to flag, sing a shortened but poignant version of Marty Robbins’ Ballad of the Alamo. 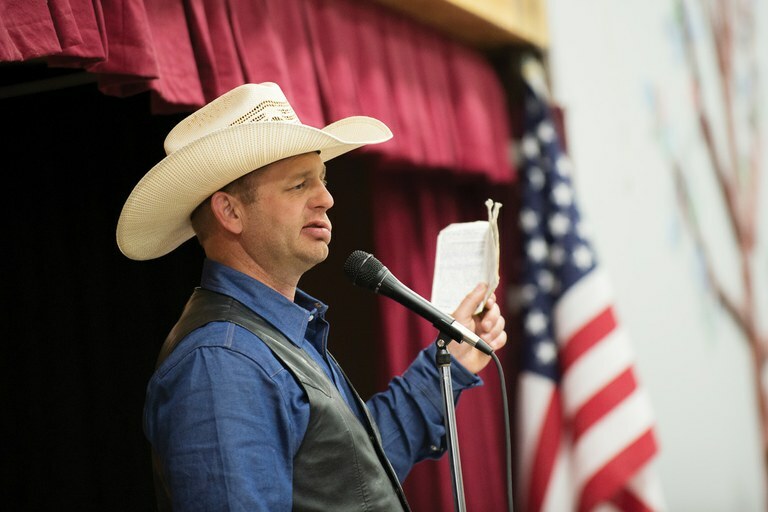 Ryan Bundy waves a Constitution as he speaks. The railroad still runs through Paradise, but, as in a hundred desolate songs and poems, the train has not stopped here in decades. For the 25 or so years I have known the town, it has been a place where people from far away come to hide out, to get off the grid (or try to), to put wreckage or bad choices or grief in the rearview. It collects the lame and the halt, the aggrieved, like the grooves of a wash plant collect the densest gravels. People tend to seek out Paradise, and Sanders County, for the isolation and the sense that this is a last holdout of the Old West, carved out of the former plats of timber companies up any of the side drainages. The stories have been the same for decades now: of unexploited gold and silver deposits, of a timber industry shut down by “eco-Nazis” in league with a tyrannical government that covets minerals, range, timber and even private-land holdings, for some nefarious globalist plan. Perhaps, then, the Freedom and Property Rally belongs here. Montana state Sen. Jennifer Fielder — a Republican who also leads the American Lands Council, which advocates the transfer of federal lands to the states — shares headliner status here with the grand old man himself, Cliven Bundy, who has driven 15 hours from his home in Bunkerville, Nevada, to meet with his followers and celebrate his freedom after soundly beating federal prosecutors who sought to imprison him and two sons for their actions during the Bunkerville standoff and the Malheur takeover. Tonight belongs to the Bundys, to their triumph, and to all the seething resentments that swirl around them like a band of cavorting imps. But we must wait for the prize. 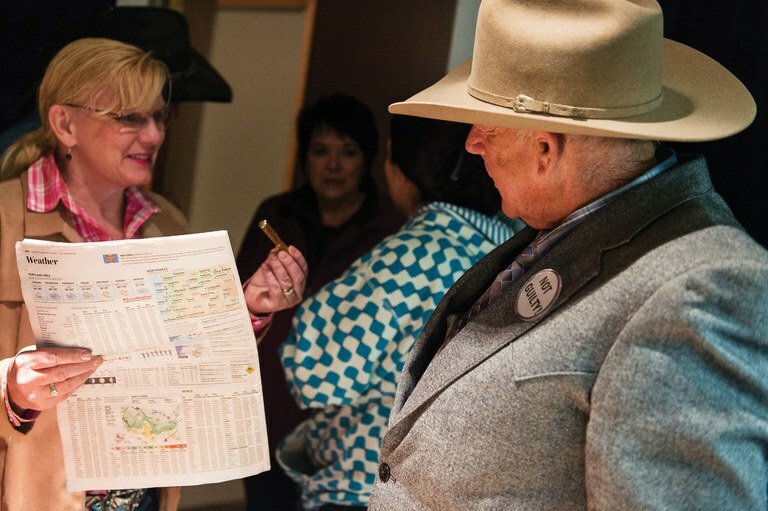 Montana state Sen. Jennifer Fielder approaches Cliven Bundy for a signature on a newspaper featuring an article about the Bundy mistrial. We listen to the rambling story of a white-bearded local man named Billy Hill, whose long history of fighting with the U.S. Forest Service and other federal agencies is also available in printed form, for free, on the table next to the petitions and the “Jury Nullification” T-shirts. Among Hill’s grievances is a dispute over open range, or grazing cattle without fees. Such a stance ought to discredit a speaker in a room partly filled with cattlemen who must pay land taxes and grazing fees — but in one of the mysteries of Paradise, tonight it does not. We hear from Shawna Cox, the middle-aged blond-haired matriarch who was in the truck driven by LaVoy Finicum when he was shot and killed by law enforcement officers during the Malheur standoff. Cox is outraged that an armed occupation of a wildlife refuge by men kitted out for war inspired an armed response from law enforcement. Much of the crowd seems to share her outrage; in fact, outrage is the primary currency here, Finicum the fallen martyr around which it coalesces. Cliven Bundy takes the stage at the old schoolhouse in Paradise, Montana, for the Freedom and Property Rally. When Cliven Bundy finally steps to the microphone, the crowd cheers, but not for long. The elder Bundy has served, he reminds us, 700 days in jail, but he is not here to celebrate his freedom, nor to revel in the adoration of the people of Paradise. He is here to admonish, even to scold. He tells the audience they are Montanans, citizens of a sovereign state, and that they have failed to live up to that fact. He refers to himself in the third person. “Who is Cliven mad at?” he asks. It is late. We’ve been here for hours. The panel of speakers looks weary behind Cliven. Ryan, as if lulled by his father’s voice, closes his eyes and seems to doze, his big Stetson cocked forward a bit. Even now, the rally is not over. There is a benediction, more talk, more fellowship. And why not? Where is there to go, with the ice-clotted Clark Fork River right outside, the dark settlement quiet under the looming darker mountains? In all this tyrannized, fallen nation, what better place than here, in the comfortable company of the true believers? Hal Herring, a contributing editor at Field and Stream, wrote his first story for High Country News in 1998. He covers environment, guns, conservation and public-lands issues for a variety of publications.